Yesterday I had a vacation day and spent the morning doing fun things with my mom. For lunch I talked her into trying something neither of us had had before, Russian food. There is this Russian buffet I've always wanted to check out called Astoria Russian Bistro. So we went. We were the only ones in there, but I don't understand why because the food was really good. Hopefully they do better business for dinner service or something. I know I'll be returning. There was an advantage to the slow business day...our waitress walked us through everything on the buffet! Yeah, the service was very friendly and fast. 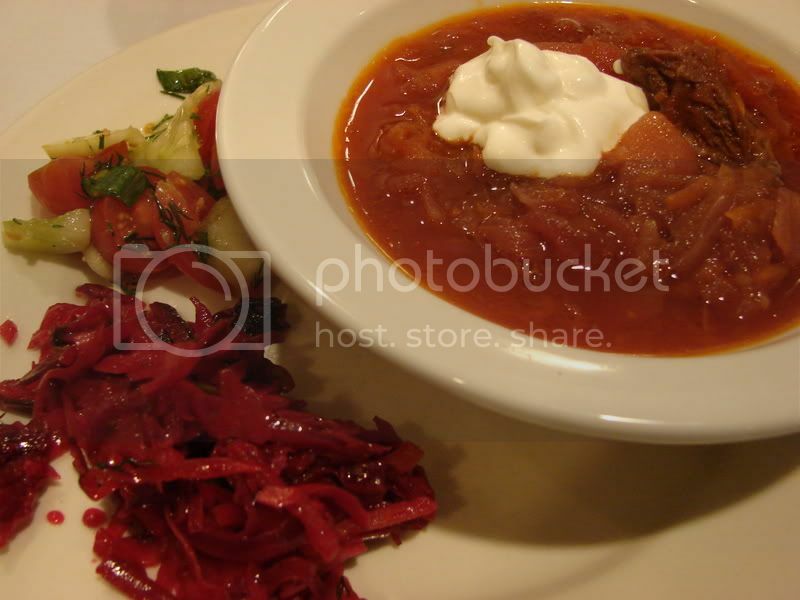 I started with a bowl of Borscht, a soup with beets, cabbage and beef, and a couple of cold salads, shredded beets and an extremely tasty tomato and cucumber salad with lots of fresh dill. My mom had a mushroom soup, which I tasted. It was good too. It had some spiciness that I couldn't place, but my anti-spiciness mom ate the whole bowl. My next plate consisted of a rice pilaf with big hunks of lamb. See the bone in there? That's what I like to see! 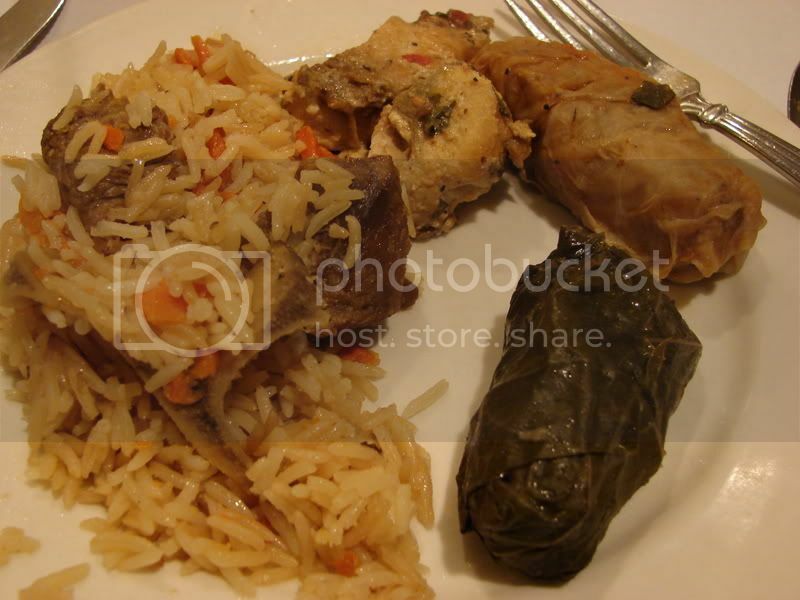 Also a fish entree that was very flavorful, stuffed cabbage and stuffed grapeleaf. All of it was yummy and homey. My mom had the Beef Stroganoff, which I also snuck a bite of. Delicious!! My last plate, which I went back for even though I was already stuffed, had a beef and potato stew (pictured), a potato pancake and some sort of pasta/beef roll. The highlight was this stew. It had fresh dill in it, and was chock full of veggies. Extremely flavorful and hearty. I got a suprise when I put a yellow vegetable in my mouth, thinking maybe it was squash or something, and it was a big hunk of stewed lemon! Not entirely unpleasant, but sour and unexpected. Here's where Anthony Bourdain went on his trip to Russia for No Reservations. 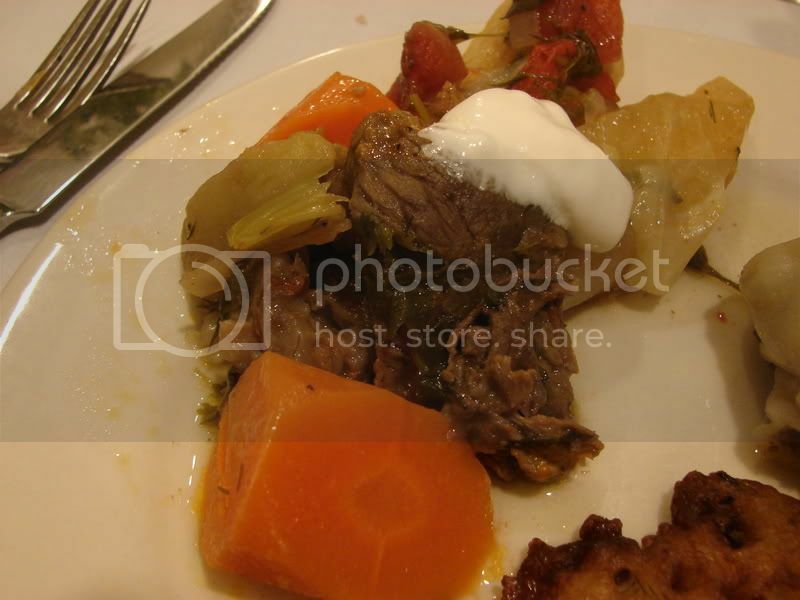 Here's a big database of Russian recipes.